This handsome, twin-towered, beige-brick, 39-story apartment building was erected by the Brodsky Organization in 1994. It is a rental and has 800 units. The free-standing building has a one-acre park, a garage, video security, a concierge, a doorman, a driveway, a bicycle room, lush sidewalk landscaping, a two-and-a-half-story limestone base, and valet service. There is a supermarket nearby and a day school in the base of this building. There is good public transportation and local shopping. 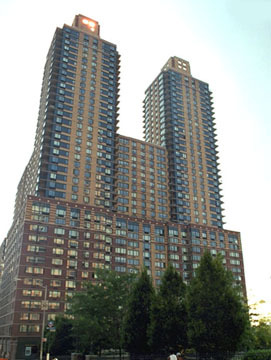 This large development is very close to the Lincoln Center for the Performing Arts and to Columbus Circle and some of its spectacular views to the east were altered with the construction, beginning in 2001, of the Time Warner Center, the twin-towered, mixed-use building on the former site of the New York Coliseum on Columbus Circle. This building has a doorman, a concierge, a fitness center, a swimming pool, a driveway, a garage, consistent fenestration, a bicycle room, discrete air-conditioners, sidewalk landscaping and many apartments.